A task force led by Madeleine K Albright, former Secretary of State, and an advisor to Obama and Clinton, is releasing today a report on world genocide threats which will likely be used by the Obama administration as a guide post to prevent developing genocides, Washington Post reported. President elect Obama, Secretary of State-designate Hillary Clinton come into the office with an unusual track record of statements in tackling mass violence, and the recommendations contained in the report are timely and relevant to the new administration, Washington Post said. "Preventing genocide is an achievable goal," the report says. "Genocide is not the inevitable result of ancient hatreds or irrational leaders. It requires planning and is carried out systematically. There are ways to recognize signs and symptoms, and viable options to prevent it at every turn if we are committed and prepared," Washington Post said, quoting from the report. Two of Obama's closest foreign policy advisers during the campaign, Susan E. Rice and Tony Lake, had senior positions in the Clinton administration and have expressed regret about their failure to respond adequately to the rapid-fire genocide in Rwanda in 1994. On the issue of sovereignty, the report says: "Traditional views of sovereignty have also been major obstacles to effective international action. It has often been argued that external action in response to threats of genocide constitutes unacceptable interference in a country’s domestic affairs. There is a growing understanding, however, that sovereignty implies rights and obligations, and that states have a basic responsibility to protect their citizens from genocide and mass atrocities. No government has the right to use national sovereignty as a shield behind which it can murder its own people. The challenge for the world community is not only to state this principle, but to implement it." While the Office of War Crimes Issues of the U.S. State Department has included Sri Lanka in the list of countries in the watchlist that includes Darfur and Uganda, and Burma, a U.S. Tamil group said it is close to completing a 400+ page model indictment charging Sri Lanka for the crime of genocide. The group is planning to submit its report to the U.S. Justice Department. The Group has also met with a member of the Genocide Prevention Task Force, and submitted a brief on the charges being leveled against Sri Lanka officials. 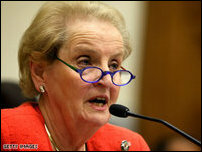 The Genocide Prevention Task Force, co-chaired by former Secretary of State Madeleine K. Albright and former Secretary of Defense William S. Cohen was jointly convened by the United States Holocaust Memorial Museum, the American Academy of Diplomacy, and the United States Institute of Peace. Task Force sought to develop practical policy recommendations to enhance the capacity of the U.S. government to recognize and respond to future threats of genocide and mass atrocities. 08.01.08 Obama: Sri Lanka afflicted with "problem of the other"